With your Salesforce data in Heroku Postgres, you can easily combine the capabilities of the Lightning Platform and Heroku. Apps built using standard open source stacks, like Rails, Node.js and Python, connect natively to Postgres – and via Heroku Connect, directly back to Salesforce. Creating apps that extend your data and processes directly to your customers is now as simple as writing SQL. Heroku External Objects allows you to make data in a Heroku Postgres database available within your Salesforce deployment to create, read, update, and delete. 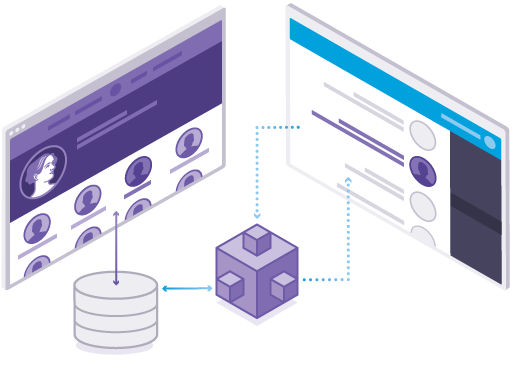 You can build sophisticated apps in Heroku and have your application data exposed in Salesforce business processes, allowing you to create seamless experiences, while keeping all of the data in Heroku Postgres. App data, product data, sensor data, customer data — any data in Heroku Postgres can be integrated into Salesforce with a simple point and click configuration. Heroku External Objects provides a new architectural option for building engagement apps that create unified customer experiences across business systems. 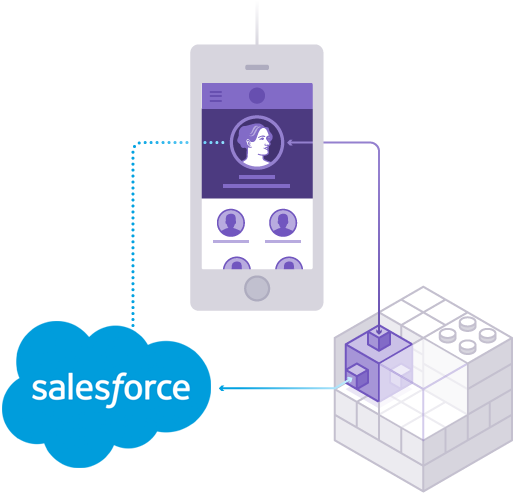 Used with Salesforce Connect, Heroku External Objects is available as part of Heroku Connect. Heroku Shield Connect* lets you build Heroku apps that share sensitive data with your Salesforce instance in a high compliance environment. Using bi-directional synchronization between Salesforce and Shield Postgres, you can extend your CRM to your Heroku apps and safely share Protected Health Information (PHI) or Personally Identifiable Information (PII) data, including contacts, account data, and other custom objects, in a secure environment. Shield Connect makes it easier to build engaging apps for high compliance industries, such as health care and life sciences, while meeting strict HIPAA requirements. Shield Connect is a component of the Heroku Shield suite of services and is designed to simplify your path to complex regulatory compliance. 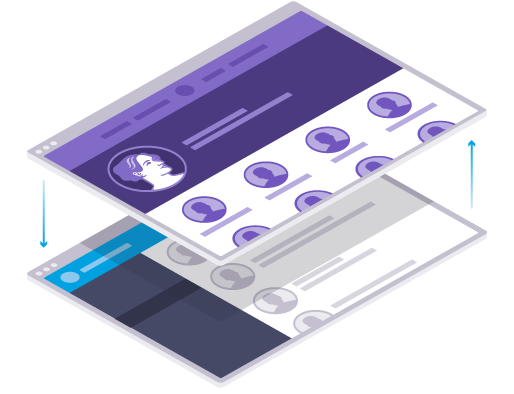 Learn more about Heroku’s compliance programs and certifications by visiting our compliance center. Heroku works directly with your development flow and your favorite stacks and languages. With the Heroku add-on ecosystem, the most popular tools and databases – such as Mongo, New Relic and Redis – are easily available to your apps. And with Heroku already serving over 23 billion transactions a day, including popular consumer-scale Internet sites like Bonobos and Upworthy – it has the proven ability to scale to your most demanding and high volume customer applications. Heroku Connect is the glue that unites our customer-facing apps with our administration backend. Data synchronizes back and forth seamlessly. With Heroku Connect we were able to quickly transform our global organization by providing our executive team with the ability to analyze company-wide big data in real-time. Configure Heroku Connect through a Web UI that is easy for either developers and Salesforce business users to set-up and manage. Choose Read-Only or Read/Write mode. Map as many Salesforce objects and fields as you need. Heroku Connect replicates your Salesforce data model inside Postgres and supports all standard and custom Salesforce objects. Heroku Connect uses a variety of methods to optimize interactions between a Heroku Postgres database and the Lightning Platform APIs, including SOAP, Bulk, Streaming and other batch processes. Choose the objects and attributes you want to map between the systems and commit. The synchronization process will operate automatically. The result: integrated application data across the Lightning Platform and Heroku. Heroku Connect provides a way to cleanly separate Salesforce API interactions from application code. Build applications on Heroku that use the leading open source database, Postgres. Perform data transformations inside Postgres using standard SQL. Developer centric Heroku Connect features like detailed logs, subscription notifications, and replication of setup across environments via configuration files improve developer workflow. 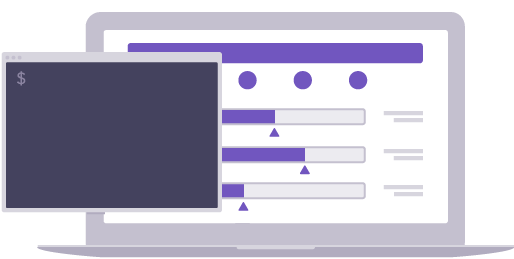 Heroku Postgres is a SQL database-as-a-service that lets you focus on building your application instead of messing around with database management. With features like forking and following, data rollbacks, data clips, and multi-ingress, working with Postgres has never been more powerful and intuitive. Continuous data protection, automatic health checks, and high availability at the premium level means you can scale without worry. With Heroku External Objects, you can expose app data stored in Heroku Postgres inside Salesforce for use in business processes such as service case management. You can view and update ecommerce order details, external device status, or service requests. The data in Postgres is exposed as an external object and queried on access to facilitate real-time integration by reference, so you can access fresh data without needless copies. Heroku Connect provides an API to automate the creation, maintenance, and monitoring of sync operations. This endpoint helps with tasks that most need repeatable automation, such as: consistent configuration across development, staging, and production environments; managing connections across multiple Salesforce deployments, and integrating Heroku Connect status with existing operational systems and alerts. Want to learn more about Heroku Connect? Please tell us about your project and we'll be in touch.